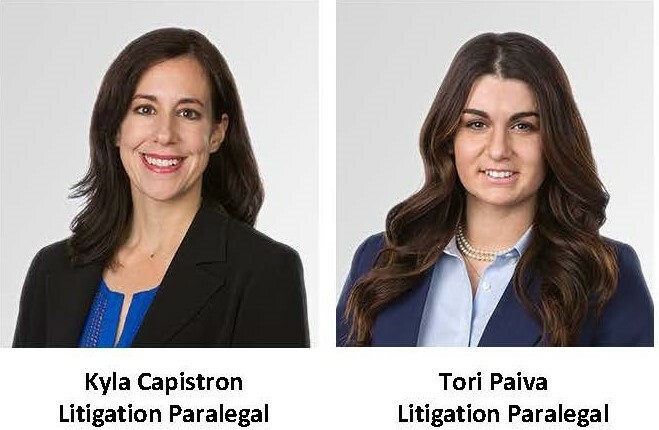 CMBG3 is pleased to introduce two incredible paralegals to our team – Kyla Capistron and Tori Paiva. Kyla is a litigation paralegal with over 12 years of experience in the toxic tort field. Kyla received her paralegal certificate in 2006 and worked in two prominent law firms in California, where she specialized in asbestos litigation, toxic torts, and developing experts for cases and trials. A native of the Boston area, Kyla now lives in California and joins CMBG3’s new California practice in our southern California office. Tori worked as a litigation paralegal at a nationally prominent law firm in Boston prior to joining the CMBG3 team. There, she focused her work on personal injury, general liability, workers compensation, and Social Security disability. Tori is a 2016 graduate of the University of Maine, where (among other activities) she was active in community events and fundraising for her graduating class. Tori joins CMBG3’s Boston office team as one of our Litigation Paralegals. Welcome, Kyla and Tori! We are thrilled to have you as parts of our team!